ICON Aircrafts mission is to bring the freedom, fun, and adventure of flying to all who have dreamed of flight. The FAAs dramatic 2004 regulation changes that created the Light Sport Aircraft category have redefined the possibilities for aviation and allowed ICON to reinvent flying by focusing on the consumer experience. ICONs intent is to democratize aviation the same way that great brands like Apple, BMW, Ducati, or Oakley democratize their products: by fusing outstanding engineering with world-class consumer product design. The end goal is to create products that not only deliver great functional benefit but also deeply inspire us on an emotional level. ICONs unique vision, combining personal aviation and sophisticated design, reflects the passions of its founders. 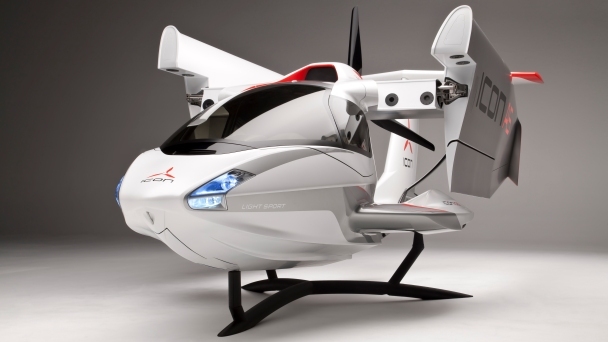 The idea for the company was conceived by Kirk Hawkins when he first learned about the impending FAA regulation change. Hawkins is a former U.S. Air Force F-16 pilot and a long-time motorsport enthusiast. After graduating from Stanford Business School, he founded ICON in 2006 in Silicon Valley with former classmate Steen Strand. Strand, a Harvard graduate with a masters in Product Design from Stanford, is a serial entrepreneur focused on consumer product design. In 2007, a team of world-class aeronautical engineers and fabricators joined ICON. Much of that team came from Burt Rutans famed Scaled Composites, including VP of Engineering Matthew Gionta and Lead Aero Engineer Jon Karkow. Scaled is famous for its record-setting projects including Voyager, Global Flyer, the X-Prize winning SpaceShipOne, and Virgin Galactics SpaceShipTwo. ICONs facilities are located in Southern California, a hotbed for automotive design and aerospace engineering. This really does look like an aircraft from the latest Star Wars Blockbuster.